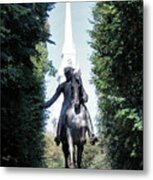 Queen duvet cover (88" x 88") featuring the image "Paul Revere" by Kristin Elmquist. Our soft microfiber duvet covers are hand sewn and include a hidden zipper for easy washing and assembly. Your selected image is printed on the top surface with a soft white surface underneath. All duvet covers are machine washable with cold water and a mild detergent. Thanks, Connie. :) I was excited to see that this one had sold. Kristin, congratulations on your sale! I'm so happy for you. 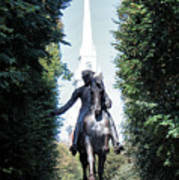 A bronze statue memorializes Paul Revere and his midnight ride. 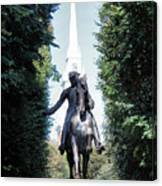 Behind the statue, is the steeple tower of the Old North Church where a lantern is hung. 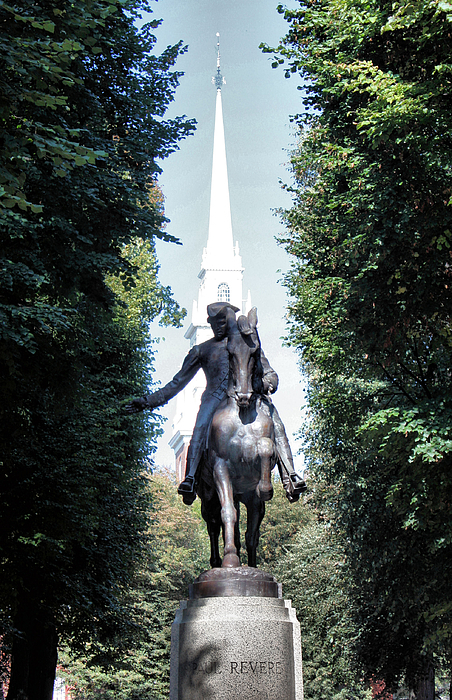 One if by land, and two if by sea is from Henry Wadsworth Longfellow's poem, "Paul Revere's Ride". One lantern was to notify Charlestown that the British Army would march over Boston Neck and the Great Bridge, and two were to notify them that the troops were taking boats across the Charles River to land near Phips farm. After receiving the signal, the Charlestown Patriots sent out a rider to Lexington, but this rider did not reach his destination and his identity has disappeared from history. He was the one who might have been captured by a British patrol.